Abstract: Precision Medicine seeks to understand how the complex interplay between panomics, environment, lifestyle and behavior influence individual disease risk, patterns of disease progression and variation in therapeutic responses. Realization of these aspirations will shift the emphasis in clinical care from reactive responses to episodes of disease and “one-size-fits-all” therapeutic paradigms to an increasingly proactive emphasis on disease prevention, earlier disease detection and treatment selection based on differences in the molecular pathogenesis of disease in individual patients. In parallel, the use of body sensors, mobile devices and social media platforms will enable real time monitoring of individual health status in non-healthcare settings to improve treatment compliance and reduce overall health risk. Collectively, these trends will redraw the boundaries of clinical medicine, and will attract new participants from the telecommunications, electronics, robotics, computing, and the consumer marketing industries. Above all, the convergence of biomedicine with these industries will generate “Big Data” of unprecedented scale, diversity and complexity. Precision medicine and data-intensive medicine are inextricably linked. The healthcare ecosystem is ill-prepared for this data deluge. It will impose profound changes on clinical practice, medical education and the organization of healthcare services. New capabilities for proficient integration and analysis of massive, highly heterogenous data will require major investments in data science personnel, computing infrastructure and the use of machine learning and artificial intelligence to develop decision-support tools for clinicians, patients and consumers. Despite the logic of these technology-centric trajectories, the need to demonstrate that they reduce the cost of care and improve health outcomes will loom large in determining the speed at which they are adopted and fulfill the full promise of Precision Medicine. The likely primacy of cost-reduction strategies will pose perplexing ethical, legal, and public policy issues about how the value of innovation is defined, how much innovation can be afforded and how priorities are set. 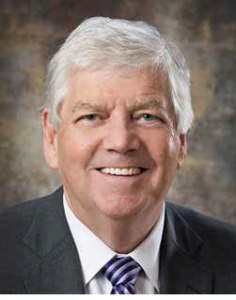 Bio: Dr. George Poste is Chief Scientist, Complex Adaptive Systems Initiative (CASI) (http://www.casi.asu.edu/(link is external)), Regents’ Professor and Del E. Webb Chair in Health Innovation at Arizona State University. He assumed this post in February 2009. This program links expertise across the university in research on synthetic biology, ubiquitous sensing and healthcare informatics for personalized medicine. He founded the Biodesign Institute at ASU (www.biodesign.asu.edu/(link is external)) and served as Director for 2003 to 2009. In creating this Institute, Dr. Poste designed and built 400,000 sq. ft. of new facilities, achieved cumulative research funding of $300 million and recruited over 60 faculty, including three members of the National Academies of Science and Engineering. He serves on the Board of Directors of Monsanto (since 2003), Exelixis (since 2004), Caris Life Sciences (since 2005), and the Scientific Advisory Board of Synthetic Genomics (since 2009). From 1992 to 1999 he was Chief Science and Technology Officer and President, R&D of SmithKline Beecham (SB). During his tenure at SB he was associated with the successful registration of 31 drug, vaccine and diagnostic products. In 2004 he was named as ‘R&D Scientist of the Year’ by R&D Magazine, in 2006 he received the Einstein award from the Global Business Leadership Council and in 2009 received the Scrip Lifetime Achievement award voted by the leadership of the global pharmaceutical industry. He has published over 350 research papers and edited 14 books on pharmaceutical technologies and oncology. He has received honorary degrees in science, law and medicine for his research contributions and was honored in 1999 by HM Queen Elizabeth II as a Commander of the British Empire for his contributions to international healthcare and security. He is a Fellow of the Royal Society, the Royal College of Pathologists and the UK Academy of Medicine, a Distinguished Fellow at the Hoover Institution, Stanford University and a member of the Council for Foreign Relations. He served as a member of the Defense Science Board from 2003 to 2009 and Health Board of the US Department of Defense (DoD) and is currently a member of the US Institute of Medicine Board on Global Health. He has served as a member of Advisory Committees for multiple U.S. Government Agencies in areas of defense, national security and healthcare.